Anyone who has the good fortune of owning an Emmert's patternmaker's vise knows full well just how complete their woodworking life is. The vise can be set to an infinite number of positions and can hold whatever you throw at it. However, nearly every owner of a vise also knows that the vise is missing a part that makes the tool that much better. That missing part is the tilting jaw that fits along the machined groove on the back jaw, and allows the vise to hold securely compound angled pieces. 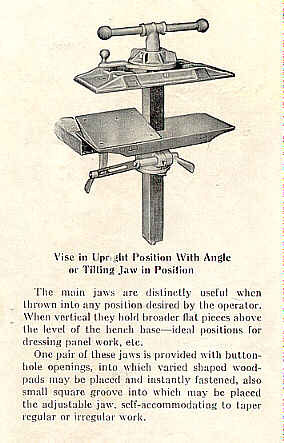 The tilting jaw can be seen in the image to the left (taken from an original Emmert's catalog), with it being the inclined plane between the two parallel jaws. The Superior Works is reproducing these tilting jaws so that you can now enjoy the thrills and chills of complex clamping. For a mere $75.00ppd, you can make your vise the complete clamping machine it once was. The jaw is cast from iron, blanchard ground, and finished with a tough black paint. It will fit both the "turtleback" and the later style (with the rotating ring) vises.